Jenny's voice was soft. "Who are you saluting, Commander?" She could see the Wabbit's reflection and thought he looked a little troubled. 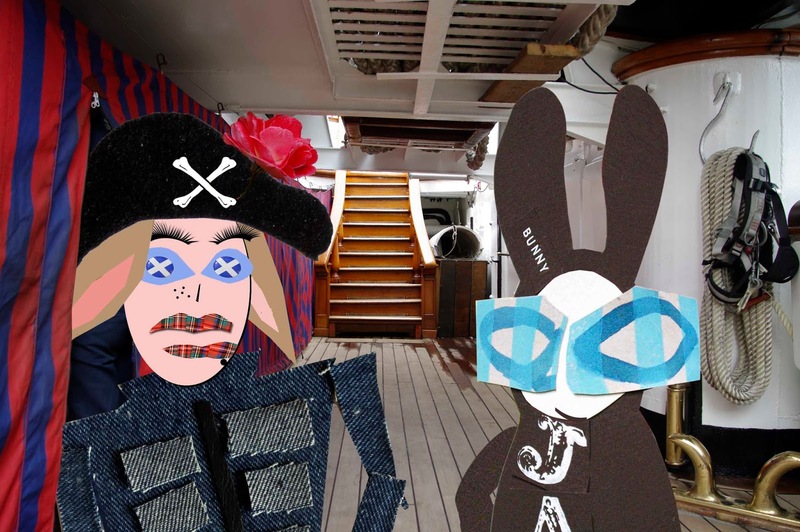 "I'm saluting the sea," said the Wabbit. He was thinking of the difficulties of the voyage. He knew there was going to be trouble and had some sense he had forgotten something. But the more he racked his brain, the foggier things became. The Lepus ploughed a steady course north. Her engine throbbed steadily. "Is there any way round the Forgotten Zone?" said the Wabbit. "Not that I can remember," replied Jenny. The Wabbit searched in his fur for the set of lucky charms he'd picked up in a market. Captain Jenny waved her hook. "There's nothing in the Zone that we can't handle." In his mind's eye the Wabbit saw a narrow and unpleasant channel that twisted through a dense jungle of bad tempered dinosaurs. Somewhere between a river and a canal, its torpid water stank of millions of years of rotting vegetables. Slimy banks crawled with the deadly Pirahnaprawn, whose taste in prey was as bad as their breath. The Wabbit sniffed. Jenny thought she's better speak. "I don't like the three headed bats." The Wabbit shuddered. "I never heard of the three headed bats." "Sorry," said Jenny, "I meant to say three headed hats." The Wabbit laughed for quite a long time. "What kind of hats?" "Top hats," said Jenny. Captain Jenny paused outside her quarters and took the Wabbit aside. "You got my message?" The Wabbit nodded. They stood silently for a long time. The Wabbit broke the silence. "How was the refit?" Jenny nodded too. "We have the extra space you asked for." The Wabbit took his paw out of his fur and pointed. "Have the cargo deck ready for the consignment arriving 0.00 Zulu Time." "I tripled the sentries." said Jenny. The Wabbit's feet thumped lightly. "I wasn't expecting to return to Wablantis. 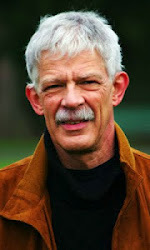 Things aren't readily ready." Jenny smiled grimly. "No-one readier than you." The Wabbit shook his head. "I'm reluctantly ready." Jenny touched the Wabbit's paw. "Wablantis needs help." The Wabbit's squinted smile was a question. "Sea Frackers?" Jenny sighed. "They landed using cloaking technology." 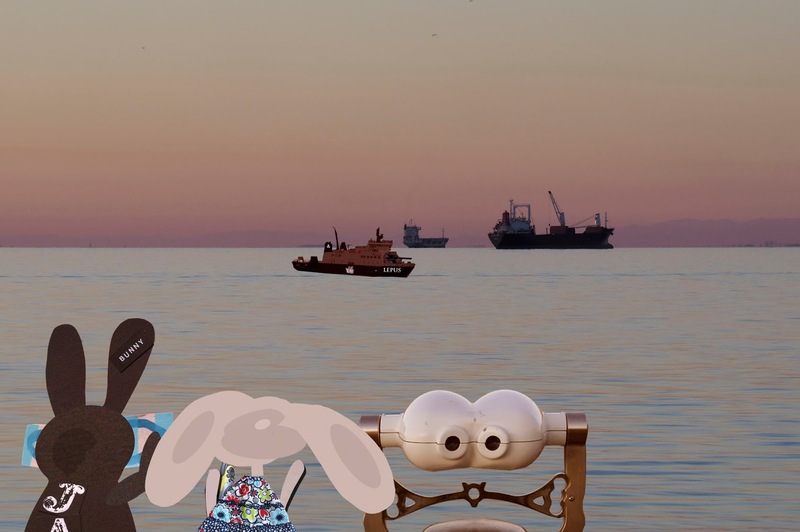 "Tricky Frackers," groaned the Wabbit. "Then they started fracking around the coast," continued Jenny. The Wabbit's smile failed miserably. "Maybe there's a chance they'll frack themselves up." At that thought, the Wabbit suddenly brightened. "I developed my wearable technology. It will make the Lepus disappear." Jenny laughed a long pirate laugh. "Except for the Jolly Roger," continued the Wabbit. "I couldn't do the flag." "Ahaar, a ghost flag," drawled Jenny. "I like the way they flutters." "Here she comes now!" Lapinette sounded excited. The sun dropped fast below the horizon - but had time to give a lick of pink paint to the bridge of the Lepus. 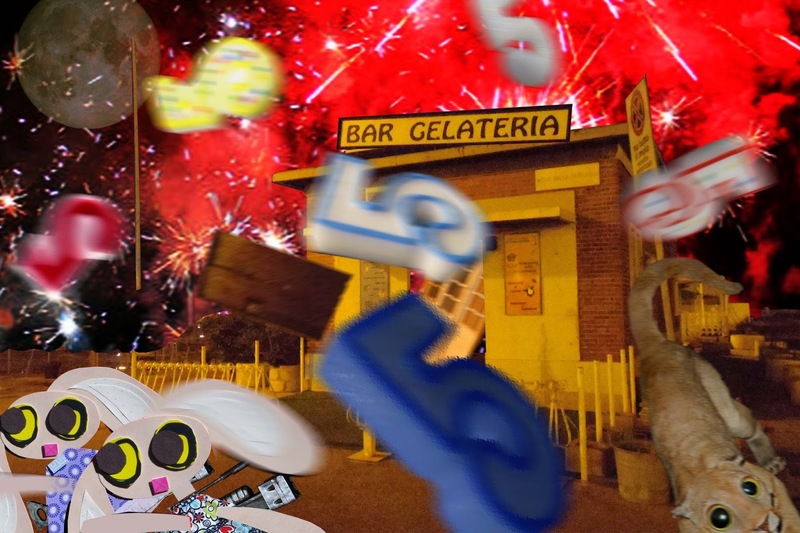 Jenny's nautical voice crackled over Lapinette's radio. "Yo MacHo, rabbits, this is the Lepus, copy?" 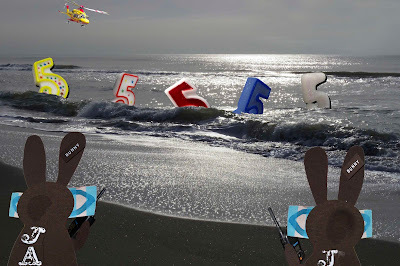 From further down the seafront, the Wabbit heard a faint cheer and he chortled. "Jenny has her admirers." Lapinette's tone was crystal. "Copy m/v Lepus, permission to berth." 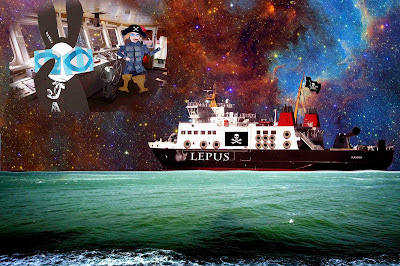 The Lepus slowed engines and swung to starboard. Lapinette noticed the Wabbit's critical eye as he stared at the manoeuvre. "Jenny can park the Lepus in a fish tank," she murmured. "A ship does not park, it docks," scowled the Wabbit. Lapinette grinned and lifted her radio. "Commander Wabbit salutes the ensign. He says you can park over there." The radio hissed and popped with Jenny's pirate laughter. "We be internationally awash with parking tickets." A foghorn blast sent seagulls spiralling as the Lepus berthed with barely a splash. 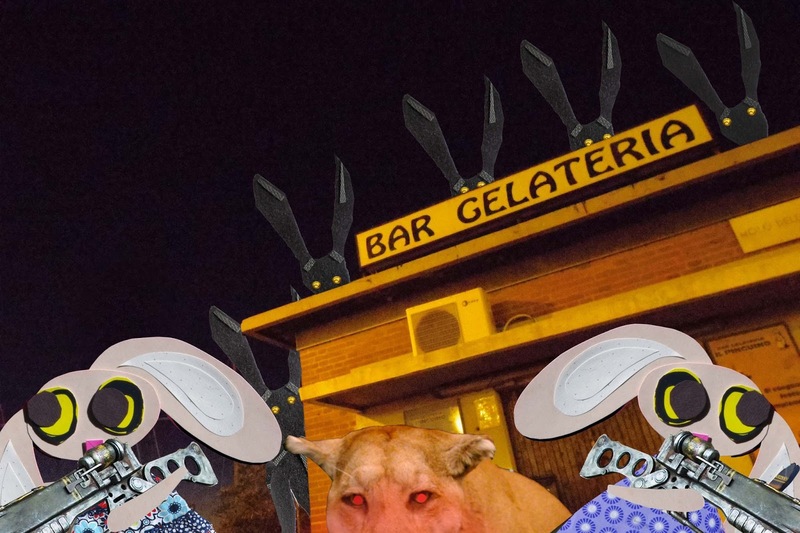 The Wabbit turned to Lapinette. "Have you any idea what all this is about?" Lapinette's ears swayed. "There's nothing hush hush." "How would you know?" asked the Wabbit "I have hush hush clearance," said Lapinette. The radio crackled. "Grog in my quarters in half an hour, copy?" The Wabbit took the radio. "Loud and clear! Out." 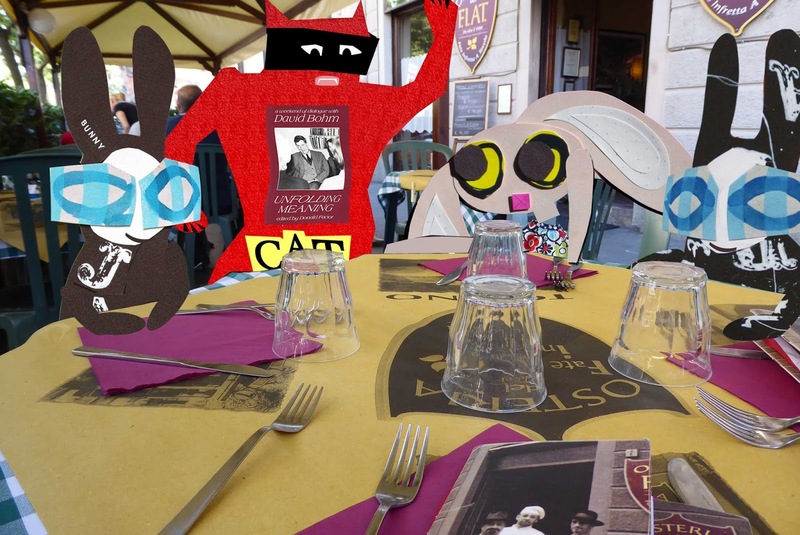 The Wabbit and his team waited for service at the Fiat Caffè. But it was slow. "Where are our opposites?" asked Lapinette. 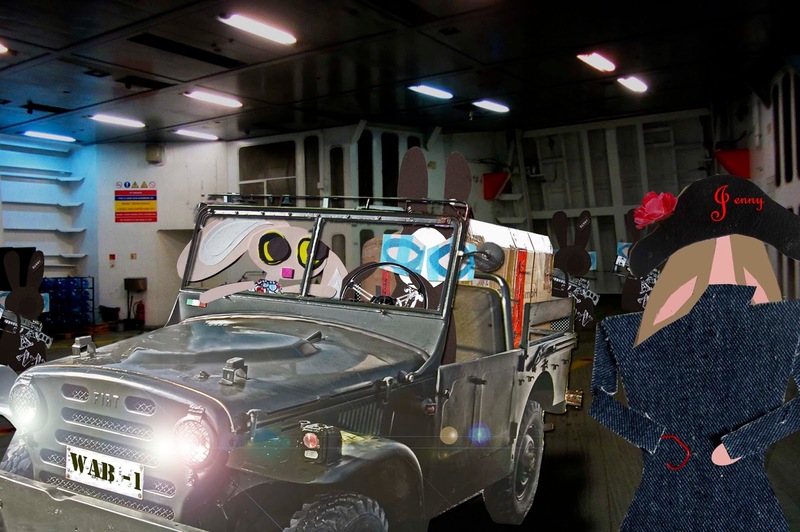 "They'll be along in a minute," said the Wabbit. "What are they doing?" said Wabsworth. "Shopping at Lingotto," said Skratch. "Great," said Lapinette. "We can move to another caffè." Wabsworth wrinkled his nose. "Do we have time?" Lapinette laughed and got up. "Where aperitivi are concerned there's always time." Both the Wabbit and Wabsworth rose with her. "Is no-one going to ask the question?" pleaded Skratch in a disappointed tone. "I will," said the Wabbit. "What kind of adventure did we just have?" Skratch began to head in the direction of Eataly, his favourite place for lunch. "It was time travel. Reshuffled time provided new spatialities, achieved by moving the present." Lapinette nodded wisely. "It was Quantum's lattice drive that moved our present." The Wabbit sniffed. He could only think of a salad sandwich and in his mind he watched one making itself. His tummy rumbled. "Temporal relocation makes me hungry." "I think we were in hypertime," continued Lapinette. "We were a four dimensional hypersurface in five dimensional space." Now the Wabbit's rumbling was deafening. So when Wabsworth muttered about space-time, velocity and action, the Wabbit slapped him on the back. "I need an objective sandwich. This instant." Inside the bar, the Wabbit and Wabsy his opposite carefully prepared for the coup de grâce, "We have to stay on the retro side of things," said the Wabbit. His helping hand snicked forward as he licked cable ends and made connections. "Things don't change much," smiled Wabsy. They heard a snickering from the roof. Wabsy gestured. "Our friends are here." The Wabbit gave a wry smile. "The Fifth Force takes many forms." He snapped his fingers and the metallic hand made short work of the cable connections. "Ooh," he said, "I'm getting attached to this." "Let me get this straight," said Wabsy suddenly. "The Agents of Rabit are the Fifth Force." The Wabbit shook his head. "The Fifth Force is using the Agents and paying highly for the privilege." Wabsy looked nonplussed. The Wabbit continued. "As numbers, the Fifth Force would rule the universe. We would all have to be fives." Wabsy frowned. "I'm not having that. I'm one and I'm proud." 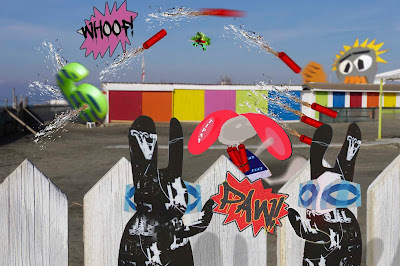 The Wabbit made a last adjustment to the detonator and murmured. "Nothing would be valid unless it was five." "Even time?" asked Wabsy. "Especially time," answered the Wabbit, "It will be 5 o'clock for ever." Ten feet beat a tattoo on the bar roof. Wabsy shuddered. "Do we have enough explosive?" The Wabbit connected the final cable with a metallic snickety click. 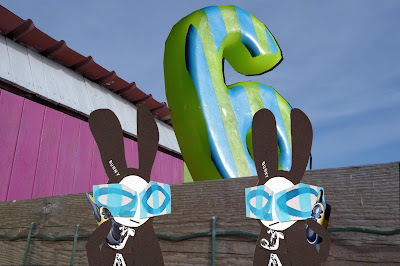 "You can never really have enough ..."
The Wabbit's second unit didn't hesitate and the Six never saw it coming until it was too late. Tipsy vaulted the fence and kicked a series of explosives into the air. "Go Panico!" she yelled. 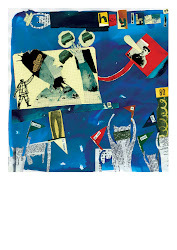 Panico trembled in his boots but he was much more scared of Tipsy than any number. He fisted the projectiles and one by one they arced across the beach huts. A series of detonations shook the ground. The Six began to topple. "Take that for your trouble," shouted Panico. For a moment the Six hauled himself up. "I'll get you for this!" he screamed, "You can't do without Six." Wabsworth and Wabsword touched paws in a high five. The flash could be seen for kilometres. Sheltering behind the huts, the two Wabbits heard the beat of dragon's wings and they looked up as Terni swooped along the beach. An explosive dropped like a depth charge. Another flash lit the beach. The Six keeled over and his moans floated across the sand. "Is this the end of Six?" Wabsworth shook his head just like the Wabbit and then he smiled. "You could have been a contender, Sixter." Wabsword grinned and called out to Tipsy. "Take him in, book him and lock him up." "On what charge?" whimpered the Six. "Unnatural acts," shouted Tipsy. 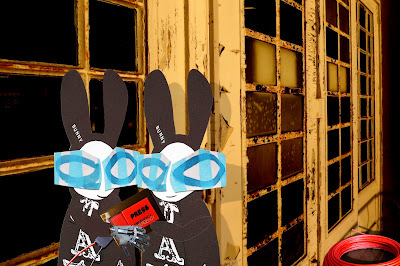 The Wabbit called his opposite Wabsy on the radio; he had a funny feeling things weren't right. "Wabsy, have you got a Six?" Radio feedback moaned and whined. "Check your six," agreed Wabsy. The Wabbits grimaced and did what rabbits did best. They froze. They did not look round. They said not a word. The Six towered over them as the Wabbit tapped an emergency Morse message for Wabsworth's team further down the beach. .-- . .... .- ...- . .- --. .. .- -. - ... .. -..- Dots and dashes confirmed they were on their way. The Six spoke suddenly with a haunting tone. "I am the next number and I have come. I am the Sixth Force." Without turning, the Wabbit snapped. "What about the Fives?" The Six's ghastly laugh curled like smoke around the beach huts. "The Fives are as fake as talk show hosts." "No fives?" said Wabsy. "Just one two three four six," moaned the Six. "Then what about seven?" demanded the Wabbit. "Never heard of it," said Six. "And if there was a seven it would be deficient. I'm six. I'm perfect. I'm a cosmological constant." The Wabbit scowled and snarled. "You're past your prime." "How dare you!" said the Six. The Wabbit's super hearing indicated that Wabsworth's team was close - so he decided to annoy the Six some more. "You're just six of one and half a dozen of the other." The Six reared in fury and shouted. "Your days are numbered!"